As soon as I got up on Friday, I could see it was going to be a beautiful day, and that made everything so much easier. In the morning we celebrated Harvey's life at Old St Paul's with over 200 people. We had planned it very carefully as "An Anthology of Harvey McQueen", with a dear friend as a superb master of ceremonies, and six other speakers covering his work as an educator, an anthologist, a memoir writer and a poet, followed by my son, and Harvey's closest friend, and me. 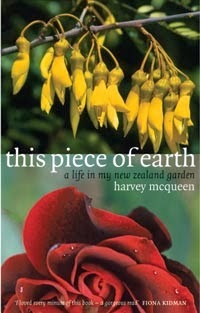 Each of us read something from Harvey's own work, but the first piece I read was written by one of the students he taught in his first job at Morrinsville College in the early 1960s - a girl called Janet, who grew up to be the poet Jan Kemp. 'It is February 1962 and I’m sitting in the third form at Morrinsville College, the girls in our summer green and white check uniforms and the boys in grey shorts & shirts with sandals. We are all about thirteen. The door opens wide and in comes Mr McQueen, our new Social studies teacher carrying his teacher’s leather briefcase which he plonks lightly on the desk and looks round at us smiling. You wouldn’t say his smile is a wide open simple one; he’s got an enticing sort of smile, a smile that challenges you to find something out. And we do. We learn about the Romans in Britain and Hadrian’s Wall. We learn about the ancient Greeks and draw maps to locate places like Ephesus and Troy. We learn about Cretan Minoan culture and that you can dig up the past. Things not often talked about in Morrinsville, though someone might sometimes find a Maori adze in a paddock. At playtime I’m going to sit next to Jim Hopa, who’s so handsome and quiet and brown. My girlfriend Jill has arranged it all. I can’t wait, so when Mr McQueen asks me a question and I’m not listening, he says “I expected you’d be paying attention, Janet!” and I’m called to order in no uncertain way. He sees everything. He has wavy hair, a heart-shaped face and I think he looks as slender as an ironing board. He wears a greenish jacket and a tie, and brown trousers and shoes. His voice is interesting, deeper than you’d think it would be. The last piece I read was from This Piece of Earth. Much of this book reminds me of things we did that I'd completely forgotten, but I remember this particular February evening perfectly. 'The last morning of the month starts off drizzly, but the sun soon burns off the mist and the day turns hot and humid. In the evening we walk round to help friends celebrate selling their house. When we get home it’s after ten, but the hall gauge shows 27 degrees. We open the doors and sit outside with one last drink. The nicotiana, alyssum and variegated flax glow in the reflected light. Overhead are stars, always part of my childhood but rarely noticed in the city. In the afternoon the six of us - Harvey's brother and sister-in-law, his friend, my son and his partner, and me - walk down to the Karori cemetery. The kind, dignified man from Lychgate carefully places the eight-sided wooden box in the ground beneath the deep red Ingrid Bergman roses, and we each say what we want to say, to and for Harvey, and we cry. Then we walk back home. ...and two days. Incredibly busy for much of the time, with all the things that have to be done - the legalities, of course (more on this later), getting ready for my son and his friend arriving, and organising the public memorial service. In other words, not exactly normal life, whatever that means. But I'm now sleeping more or less normally, which is a huge help. I was racing to get as much as possible done before Jonathan and Eric arrived last Wednesday, and I'm really pleased I did that, it's given me time to enjoy having them here, though I won't really relax until after Friday is over. Then we'll have two weeks to go on picnics and explore Wellington properly. They fill the house with welcome human sounds, and it's lovely having cups of tea made for me and the dishes done - it's been close on three years since Harvey was able to do those things. I don't miss the work involved in looking after him, or the worry. I just miss him - especially his voice. Perhaps having the company of the "boys" - I can't help calling them that, though they're actually in their mid-forties (I was a child bride!) - will make it worse later when they've gone. But that's just too bad, I need them here now, not least because they give me something new to think about and respond to. Meanwhile the cat is showing signs of improvement - glossier fur, good appetite - so maybe she'll be around a while longer than I thought. 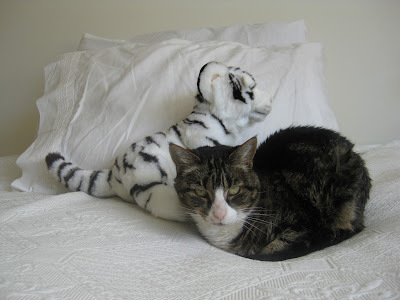 The week before last, I saw a white tiger cub in the window of the toyshop over the road and had to go in and buy it, crying all over the counter. Harvey loved tigers. Now Dorothy likes to sit near it on the bed. This is my first Elsewoman post since Harvey died in the early hours of Christmas Day. From now on I'm going to put my feminist posts mainly on The Hand Mirror and use Elsewoman to write about the experience of learning to live on my own for the first time in 65 years. The most difficult thing is exactly what I expected - not having anyone at home to talk to about what's going on in your life each day, and tell you about theirs. So I'm hoping that writing here will to some extent serve as a way of doing that. After all, what I'm now having to deal with is something that many people go through, as some of their comments on our blogs have already shown. Eating on my own is really hard too, but I'll write about that on my food blog. Given Harvey's situation, I'd already had to work out how to manage parts of my life without his company. He wasn't able to climb the stairs, so I had the two upper rooms and bathroom to myself. So that was a help - at least I was used to sleeping solo. He'd stopped going out, too, except to the doctor and the hospital, so I'd built up my own social life. It was really sad not even being able to go out together even just for coffee or to visit friends. Still, he'd become expert at managing his Fatso DVD list, and usually managed to get a movie we'd both enjoy for Saturday nights. I'd make a nice dinner and we'd settle down to watch. Now I need to ask people round to watch with me, or go out. The weird thing is that the DVDs Harvey ordered have kept coming - he had three here when he died, so when I sent them back unwatched, three more appeared. (Soon I must cancel his subscription - I won't have time to do it justice, he used to get through about 15 a month.) He had obviously set out to get ones I'd like for the holidays - there were two movies related to France, and a documentary on modern art. So this Saturday Pam and Geoff came round for fish and chips and we saw "Paris When It Sizzles", made in 1964, with William Holden and Audrey Hepburn (Harvey adored her). It turned out to be an astonishingly post-modern, satiric take on Hollywood conventions, with Holden as a blocked scriptwriter whose fragments of ideas came to life on the screen, only to get stuck and have to be reworked, sending up every movie cliche in the process. Noel Coward appeared (and helped write it), and Tony Curtis had a brilliant cameo as a dim "method actor". I enjoyed it, but Harvey would have loved it, and I would have been so pleased about that. Then I spent today sorting out his room. My son and his friend arrive on Wednesday, and I'll need papers for the lawyer this week (the office has been closed until now), so it had to be done. It wasn't as bad as I'd imagined it might be, perhaps because it had a real purpose apart from just tidying everything away. But it still all feels quite surreal - how can I be doing this?